As you might already know, Phi Phi Island is located at the southern end of Phang Nga Bay right at the point where it becomes the Andaman Sea. This jewel in the south of Thailand is equidistant between Phuket and Krabi by about 45km. The getting to Phi Phi by flight, bus, train and ferry can be some of the more interesting aspects of your travels. Although it is part of the Krabi Province, the Phi Phi Islands are situated centrally between 2 of southern Thailand's most popular tourist Destinations, Phuket and Krabi. These are holiday destinations in themselves and bring tens of thousands of holiday makers to the areas. Both Provinces have there own special brand of magic to offer the traveler and it will be a choice of making your way to our island via one of these destinations. Both provinces have international airports, however, since the volume of tourism to Phuket is so much higher, getting there by aircraft is a lot easier. The Phuket International Airport has over 12 flights a day from Bangkok where as Krabi International Airport has 4-6 flights depending on the season. Both airports service regional planes but the Phuket airport can take long haul flights from Europe. Once you've arrived at either Krabi International or Phuket International Airport, you will have to make your way to the Rasada Pier where you'll take a ferry service to the Island. These ferries leave at 8.30am and 14.30 pm and are comfortable service out to the islands. 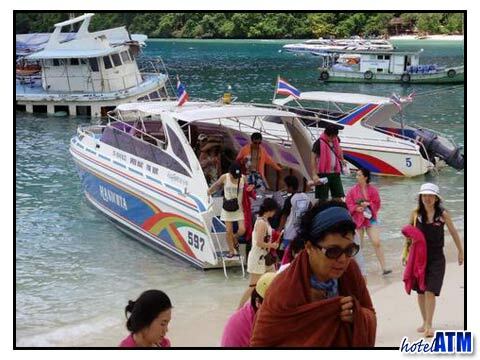 Those people coming in from further afield such as Koh Phangan for the full moon party will be aware that they must take a ferry off Koh Phangan to Samui. In Koh Samui they will have a choice of either flying to Phuket or taking another ferry to the mainland, a bus to Krabi and the the ferry to Phi Phi Island. 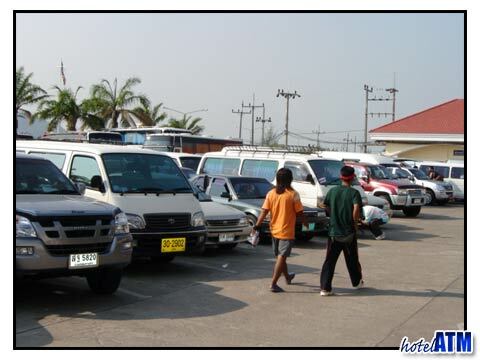 The 7 hour overland trip starts with the Haad Rin Queen feries from Haad Rin East at 09.30. This ferry arrives at Big Buddha Beach on Samui where you are picked up by bus and taken across to Koh Samui to Na Thon. From here you get the ferry to Don Sak and Surat Thani Province. From Don Sak town you get a direct 3 hour bus to the Krabi pier and then the last ferry to Phi Phi Island.